If you are designing a large spacious layout, or if you are planning an island, the Reverse Corner cabinet may be of interest to you? The Reverse Corner cabinet is simply a normal cabinet but faces out into our lounge / dining room rather than inwards into the kitchen. 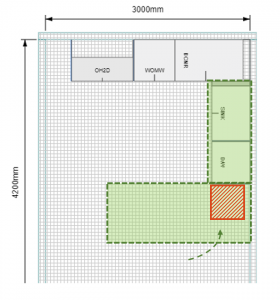 By reversing this, we make an external storage option which is easily accessible from outside the kitchen while avoiding a difficult corner option inside our design. The Reverse Corner cabinet is an affordable alternative to a traditional corner cabinet and with a smaller footprint will often give design advantages in a compact space. This is a simple option to design, assemble and install in your next project…. 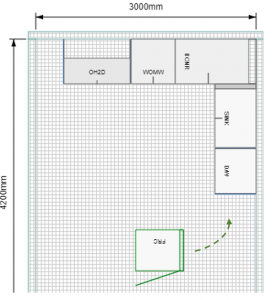 Step 1 – Design your layout. The first step is to layout the kitchen, so we know exactly where the island will go. Once you have the kitchen legs in position than you can place the reverse corner cabinet into place. Note the cabinet is a 600mm wide single door unit and is pre-supplied with a 50mm Filler Panel on the side to fit against the wall. This is available in a LEFT and RIGHT orientation so pick the correct one? The RIGHT hand version is placed against a wall on the Right! As mentioned, this cabinet has a pre-built filler panel against the wall. We also need a Filler Panel against any cabinet at the rear – in this case I have used a Dishwasher space and inserted Gable Ends into my dishwasher. I can now select the Reverse Corner cabinet (see the green outline) and on the details panel select ADD LEFT Filler Panel. You will know this is correct if you see the small grey filler panel inserted in your design. Technical Note: This filler panel is recommended at 70mm. This will then neatly match the coloured rear of the Reverse Corner ensuring a neat inside corner. This also ensure appliance or drawers do not clash on the inside corner. You can now start placing the rest of your island cabinets down on layout. Remember, these face inside to the kitchen – snap them neatly against the Reverse Corner Cabinet. 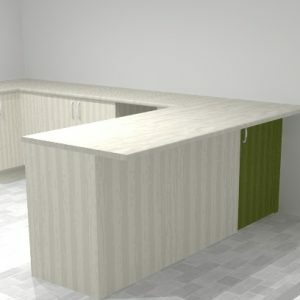 Don’t forget to place your Bar Panels and End Panels on to complete your Island design. The Reverse Corner Cabinet is the same depth as the standard carcasses – so when adjacent or placed side by side the carcasses remain aligned. Then the Reverse Corner door will sit flush with your Bar panels. 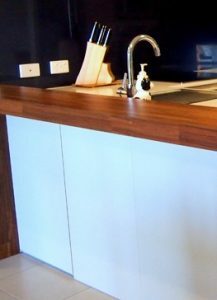 Like-wise, the Doors on the inside of the Island will sit flush with the coloured Panel on the rear of the Reverse Corner. Everything lines up neatly! 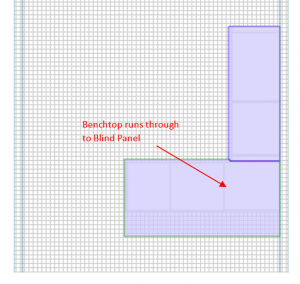 Editing your benchtop for a overhang is now a simple process. 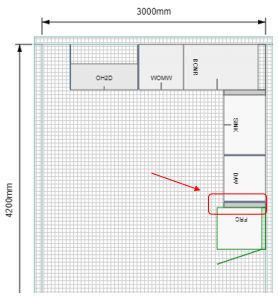 A 900mm deep benchtop is quite normal for a breakfast sitting area and provides good leg room. The Reverse Corner cabinet is a good alternative to traditional corner cabinets. Offering accessible storage options outside the kitchen may work well with your family activities. 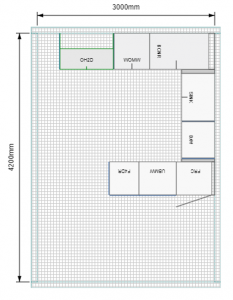 The smaller footprint comparative to a typical corner cabinet may also offer advantages where an island is desired but optimal space is not present.